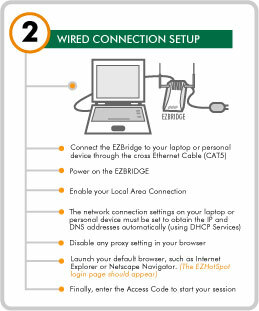 EZHotSpot provides high-speed Wi-Fi wireless (T1 or SDSL) and wired high-speed Internet access to public locations around the world. The signal is locally radiated via a small patch antenna installed in each room eliminating any other RF interference providing as much as 10 db better performance versus other alternatives through the air. Another advantage of this approach of installation is that this will eliminate imprecise and time-consuming RF site-survey as a part of pre-installation. All equipment is installed in a secured central location such as cable closets at the hotel. 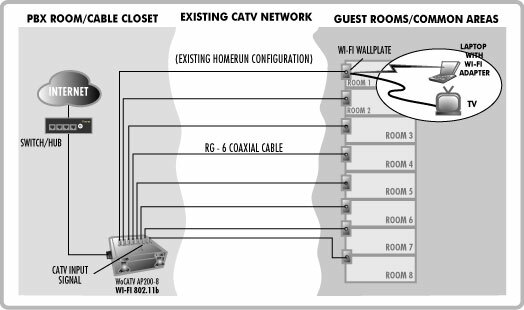 Typical Wi-Fi HSIA installatin requires installing access points to a location such as attics or on the roof causing additional eletrical work or running CAT5 cables tot he access points by tearing up walls or modifying existing building infrastructure. With increased wireless usage around the nation, our goal is to provide users immediate access to their email or any other internet activity they require with no hassle. We can provide both a wireless and a total managed solution and show you how to drive customers and put extra revenue and traffic to your location. The advantage of EZHotSpot is its ease of use—we install the system, give training presentations to your staff, and provide 24x7 customer support. Your loyal customers will appreciate the ease of the set-up, freedom and flexibility that EZHotSpot wireless access gives them. Non-Intrusive System: The equipment is installed in a secure location such as PBX Room/cable closet. 100% Coverage: Eliminates time consuming RF site survey. Cost Effective: Teletronics offers a very competitive pricing package. Flexible: Easy to integrate with off-shelf Video on Demand (VoD) solutions and TV. More Guests: EZHotSpot can attract loyal customers to your hotel, and make existing ones even happier. No Hassle: Maintenance free with full equipment warranty. from billing to security management. 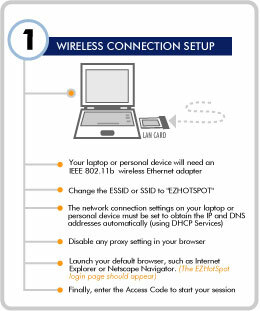 Customer Support: EZHotSpot handles all the installation, configuration, technical, and customer support. If you are interested in discussing any of these alternatives, please let us know your requirements.